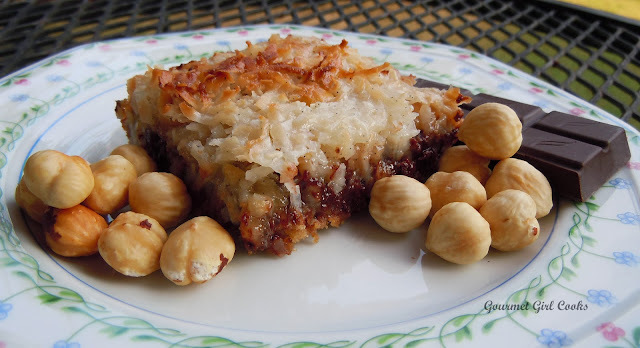 Gourmet Girl Cooks: Chocolate Hazelnut Cookie Bars - "Celebrate Summer's End Recipe #3"
Chocolate Hazelnut Cookie Bars - "Celebrate Summer's End Recipe #3"
Happy Labor Day! We had a busy weekend! Both my sons came over yesterday for a cookout (my daughter had plans this weekend and couldn't come). I decided to take the night off from photos and posting last night and enjoyed their company instead...we had grilled steak, salmon, chopped salad and my Yellow Cheddar Squash Casserole for dinner and we enjoyed the Lemon-Coconut-Blueberry Frozen Greek Yogurt Bars I made for dessert. It was a delicious meal and the frozen yogurt pops were outstanding! They tasted even better than they looked. Both boys ended up spending the night and were here all day long today, too -- what a treat! 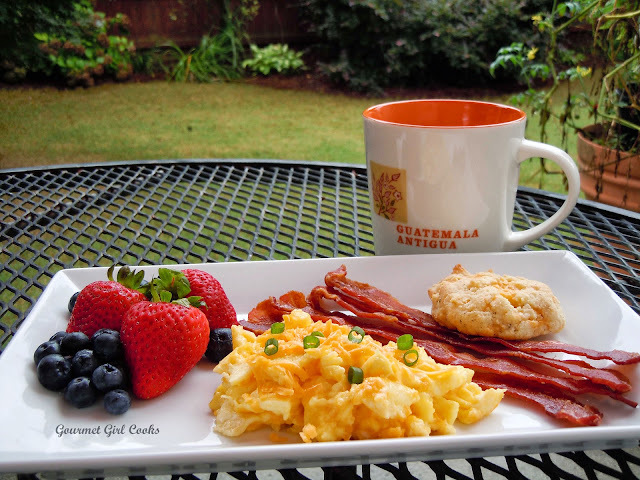 We slept in late and I made us a big breakfast of scrambled organic eggs w/ cheddar cheese, oven roasted uncured bacon, fresh fruit and my Easy Cheddar Black Pepper Biscuits. 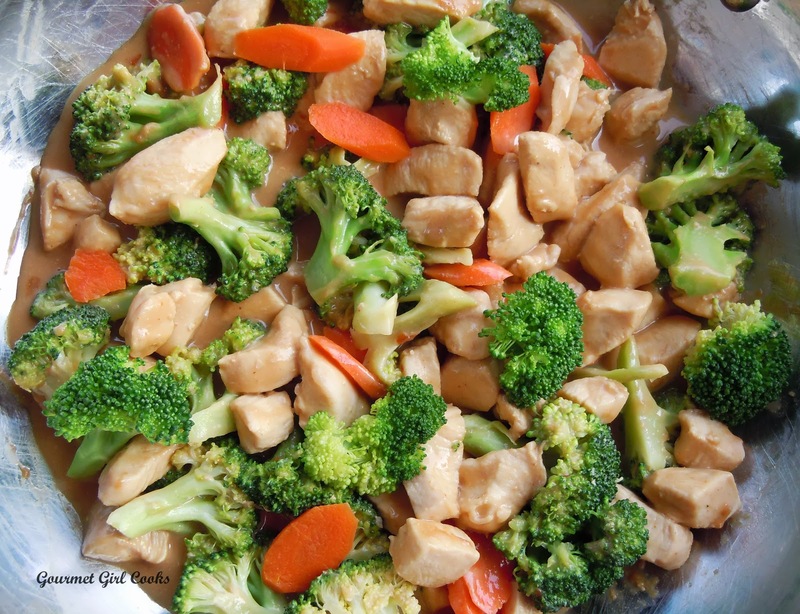 For dinner, I made us a quick and easy Chicken & Broccoli Stir-Fry since we did our grilling last night. While hanging around the house this afternoon with the boys, I decided to make a dessert using the hazelnuts I had picked up at Costco a few weeks ago. I decided to make a cookie bar that included both chocolate and hazelnuts. 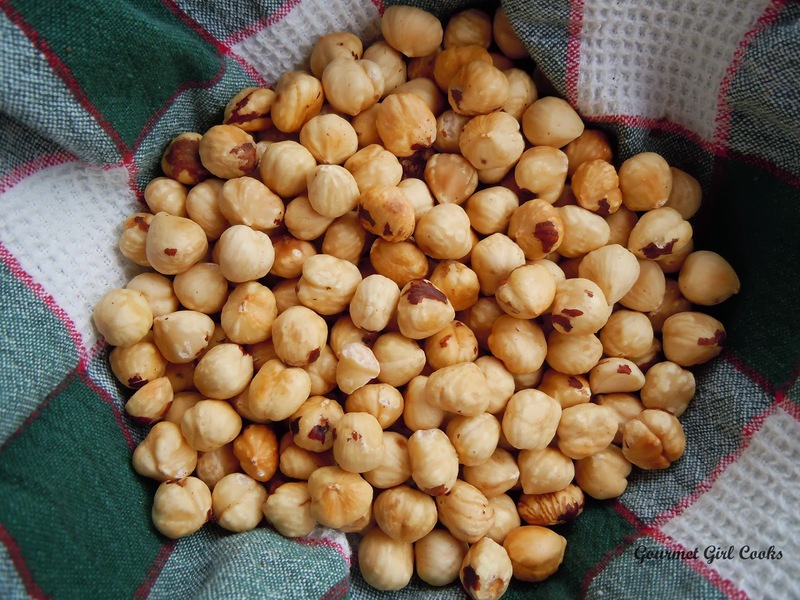 Since the hazelnuts were natural (as in not roasted), I decided to roast them a bit to bring out their nuttiness. I roasted them at 350 degrees for about 12 minutes and then placed them in a dish towel to rub off their skins. It was fairly simple to do. After they cooled, I chopped them to go into my Chocolate Hazelnut Cookie Bars. They turned out delicious. I love the combination of chocolate and hazelnuts together -- it reminds me of the sugar riddled "Nutella" I used to enjoy in my former life. These bars, however, did not contain added sugar (other than the sugar contained in the organic Green & Black's 70% bar that I chopped to use as chocolate chips). Even more amazing is that these cookie bars were made using my sugar free "Sweetened Condensed Coconut Milk"...yes, sweetened condensed coconut milk that contains NO sugar. Instead, it uses my favorite natural sugar free sweetener to bake with...Swerve!!! I used Swerve in both the crust for the cookie bars, as well as in the "sweetened condensed coconut milk" that I use to make them. Do you know HOW many doors to other decadent recipes this one little sugar free recipe for sweetened condensed coconut milk opens??? It opens LOTS of doors and possibilities! It's liquid gold...especially with the upcoming baking season upon us. On of the ingredients in my sweetened condensed coconut milk is vanilla extract, but this afternoon, I decided to make it using a vanilla bean (I split it lengthwise with a sharp knife and scraped out all the little vanilla seeds to add to the coconut milk) and in addition to adding the vanilla bean seeds, I tossed in the pod, too, so it could simmer with the milk and infuse vanilla flavor as it reduced. It gave an awesome vanilla flavor to the condensed milk and you can see all the little vanilla bean seeds just like you can in vanilla ice cream. If you happen to have a vanilla bean hanging around the house, you might want to try that, too...otherwise the extract works just fine. I snapped a few photos of my decadent bars below, as well as posted the recipes for both the Sweetened Condensed Coconut Milk and the Chocolate Hazelnut Cookie Bars. This was a really "sweet" way to end the Labor Day weekend! P.S. -- if you haven't yet entered to win a Weber grill as well as some free Swerve in my Swerve Giveaway (courtesy of Swerve)...make sure you check out the details on how to enter below. Enjoy! Freshly roasted and skinned hazelnuts...waiting for chop-chop time! Preheat oven to 325 degrees F. In a medium bowl, combine almond flour, flax, Swerve, cinnamon, diced butter and 1 egg. Using a pastry or dough blender/cutter, cut butter and egg into flour mixture until a thick, dense dough forms. Using your hands or a rubber spatula, press dough evenly into an 8x8" or 9x9" nonstick baking pan (or line a regular pan with parchment paper). Bake crust at 325 degrees for 12 minutes or until very lightly browned. Remove crust and let cool about 15 minutes. Increase oven temperature to 350 degrees. 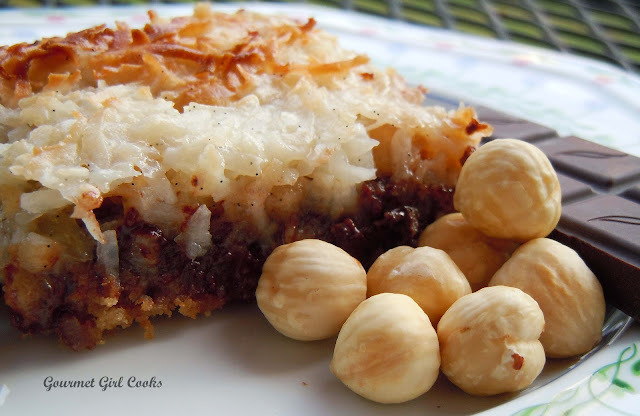 Layer chocolate, hazelnuts and coconut on top of crust and drizzle evenly with 1 cup of sweetened condensed coconut milk. Bake at 350 degrees for 15 to 18 minutes or until lightly golden on top. Let cool completely and cut into bars. Add coconut milk to a small heavy saucepan and stir in Swerve or sweetener of choice, butter and vanilla. Bring to a boil over medium-high heat. After milk comes to a boil, reduce heat to low-medium and simmer, stirring and whisking frequently for about 45 minutes until reduced almost by half. Taste for sweetness. If additional sweetness is desired, add liquid stevia drops until desired sweetness is achieved (I added about 10-15 drops). Makes approximately 2-1/2 cups of sweetened condensed coconut milk. Cool before using to make cookie bars. Refrigerate any unused portion. 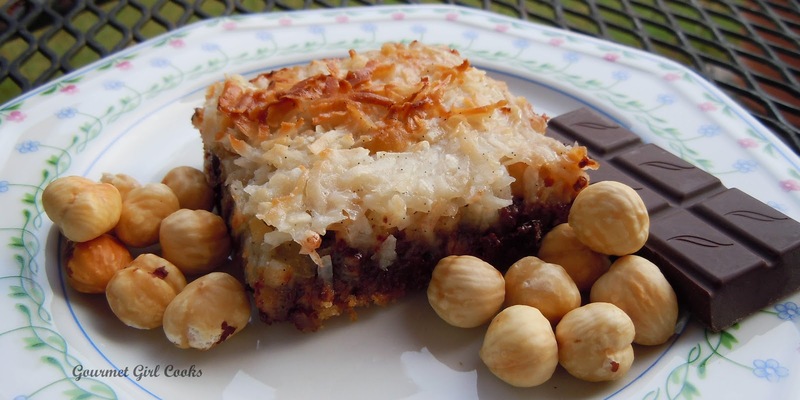 *Note: Chocolate Hazelnut Cookie Bars use only 1 cup of Sweetened Condensed Coconut Milk -- this recipe makes 2-1/2 cups. If desired, the above recipe for the sweetened condensed milk can be halved. This morning's breakfast with the boys! 5 days Left to Enter the Swerve Giveaway! The kind folks at Swerve recently contacted me and have allowed me to offer Gourmet Girl Cooks' followers a chance to win an exciting "Celebration to Summer's End Giveaway"! 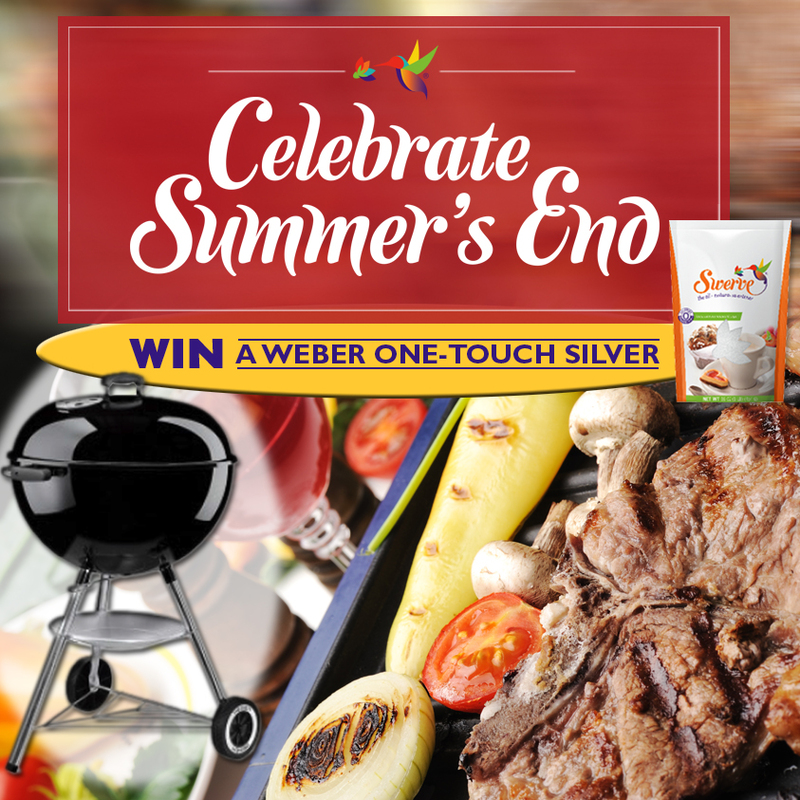 One lucky follower will win a: Weber 22.5” Silver One-Touch, Kettle Grill AND a Three-Pack of Swerve (see below). As most of you that follow me already know, I have been using Swerve for almost a year now and it is my favorite "zero calorie" natural sweetener to bake with. It tastes great and measures cup-for-cup just like sugar, which makes it super easy to substitute in recipes...no calculations involved! It contains no artificial ingredients and comes in both granular and confectioners (powdered) versions. With the upcoming Labor Day weekend ahead, I will be posting some delicious "end of summer" recipes using Swerve...so stay tuned! Ready, set....GO! Begin entering now! The winning contestant will be chosen at random (must be a U.S. resident). To enter a chance to win, all you need to do is: Leave a comment here on my blog and include the words "Swerve BBQ Contest" (1 entry per person per day). Contest ends Friday, September 6, 2013 at Midnight EDT. The winner will have 24 hours after being announced to contact Gourmet Girl Cooks (by email at GourmetGirlCooksBlog @ gmail.com) with their shipping address. If no response is received in 24 hours, a new winner will be selected. *The product provided in this giveaway is contributed by and will be sent directly to the winner by Swerve. I'll be making these soon!! Swerve BBQ Contest! My husband loves the regular version of these. I haven't made them in over a year but I see them in the near future. Thanks for posting! "Swerve BBQ Contest"
What a perfect sounding weekend.....with yummy food too. Our son and family (twin grand-daughters) live way down in Texas so we only get together about once a year. Planning a visit this fall-can't wait! They eat this way too.....can't wait to teach them some of your recipes! Still would love to win the Swerve BBQ Contest! How do you think the bars would work if you left out the chocolate? Would love to win the "Swerve BBQ Contest"
Those bars look delish! be great to serve at a BBQ. Love to win the "Swerve BBQ Contest"
My goodness, these look delicious! Sure would love to win the "Swerve BBQ Contest"
I love love love your recipes!! 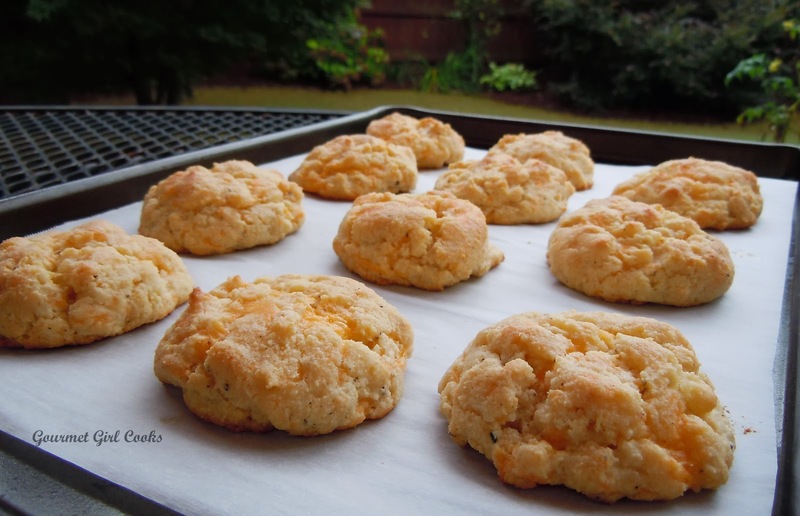 Especially the Cheddar Biscuits! OMG they are soooo good!! Even my very picky husband loves em! I would love to win the SWERVE BBQ CONTEST, and continue cooking all your awesome grill recipes! You have unsalted butter for a fat in the sweetened condensed coconut milk recipe...is there a reason not to use coconut oil here? Hi Anonymous! If you wanted the bars to have no chocolate...that would work fine -- just add a few additional nuts to the recipe for "nut bars". Make sure you give me some way to identify you if you get selected -- maybe a first name/last initial or some identifying way so I can announce you if you should win. Thanks, Deanna -- good luck! GG, you created these just for me! ( well I would like to think so lol!) Perfect! Your condensed Coconut milk is pure genius, I use it a lot, I had a jar in the fridge that I was unable to use tout de suite so I reheated it in the microwave, it was so hot,so when I put the lid on , it sealed itself and the pressure was off to use right away since my body does not always cooperate with my wishes! I would love to win the SWERVE BBQ CONTEST ! Swerve BBQ Contest - I hope it takes my comment this time! I went to Costco and completely forgot the hazel nuts. Bought 4 jars of the Almond butter which I use in the yogurt . You are right they are on the way out and I was advised to leave a complaint at the little desk that they have by the entry. If enough people voice their opinion, it might make a come back. I am glad that you had a good time with your boys! No need to respond, you will get 5 minutes more sleep, lol! Love following your blog, these Chocolate Hazelnut Cookie Bars look absolutely amazing and I can't wait to make them for my daughter. She'll be so thrilled. Yay "Swerve BBQ Contest"!!! I have been using Swerve for a few months now and I lovelovelove it and all the fun recipes, Yum! Serve BBQ Contest. Oh My Goodness! I have GOT to make those Chocolate Hazelnut bars - the sweetened condensed coconut milk too! Do you know how long the scc milk will keep? "Swerve BBQ Contest". Thanks, Carol, Christine, CyberSis & Viola G.! Good luck! I have been sugar free for 3 years and have lost over 50#. Swerve and your website have made this possible for me. Thanks! Swerve BBQ Contest. Hello.. what are the nutritional values on this? Thanks!